Carrera is a striking and interestingly bred horse from a combination of two Olympic stallions. Sire Cardento won three Silver medals under Peter Eriksson at the Olympics, the World Championship and the European Championship. Grand sire Baloubet du Rouet was Olympic Champion with Rodrigo Pessoa, a three-time winner of World Cup Finals and also claimed the winner’s sash in several GP’s and World Cup Qualifiers. Carrera’s dam is an international 1.45m jumper, and is a half-sister to the famous international jumper stallion Tinka’s Boy, winner of many GP’s and World Cup Qualifiers plus the final with Markus Fuchs. Carrera exhibits quality by jumping with much scope, carefulness and a very positive attitude. Ridden by James Billington he jumped his first Grand Prix’s and placed high in many classes last year (2014). Carrera has now moved to the stables of Jur Vrieling who will compete with him at international level. His first offspring appear to be modern jumper types - having size, length, blood and three good gaits. His first three-year olds jump with much scope and show an excellent technique. Carrera meets the KWPN requirements for Radiographs and Roaring. Jumping Index: 140. 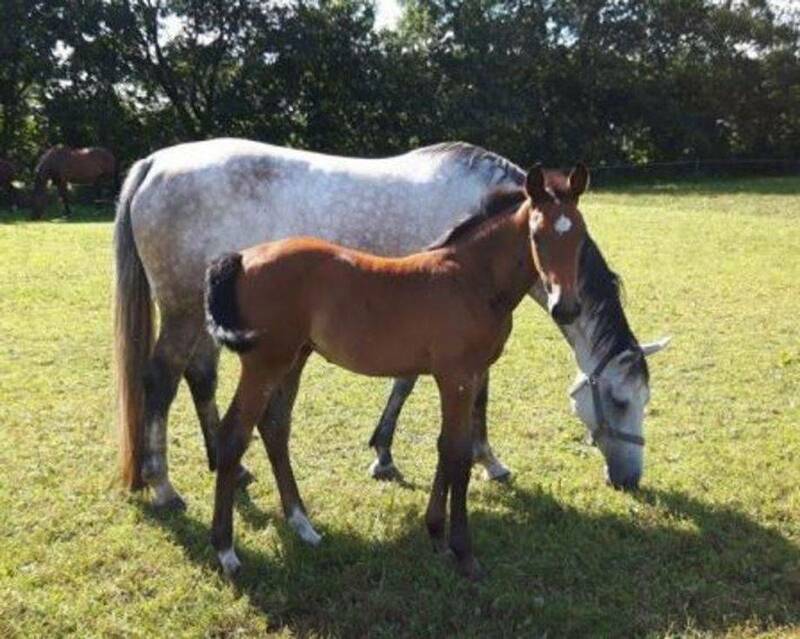 A grey/bay filly was born June 27, 2016 for the new owners of Ellamieka. We wish them all the best with their new filly!